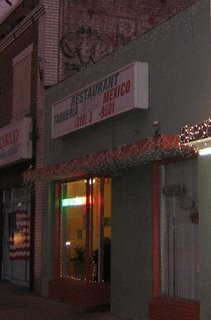 Keeping with the theme of investigating my local taquerias I headed to Taqueria Estilo Mexico on Washington Blvd. Nice decor inside with an expansive seating area would make this a nice taqueria to dine at but I had some cold coronas waiting for me at home so I ordered my tacos to go. I ordered two asada, one carnitas and one adobado(marinated bbq pork) and filled some containers of salsa roja, salsa verde and some marinated carrots from the salsa bar. First up was the carnitas. I poured some salsa roja over the meat and dug in.The smell of pork hit my senses first as the tortillas almost broke apart under the weight of the juicy chunks of pork.I dont think I have had carnitas this soft and tender and after scooping up the remaining chunks of pork that fell out of my taco I regretted that I didn't order more carnitas. They were delicious. Still had some pork to tackle though and I opened up my adobada taco. 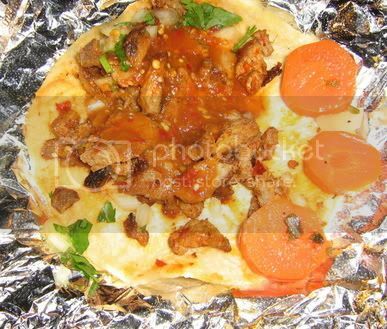 The first thing I noticed before pouring some salsa roja on the taco was how lean and heavily marinated the pork was.The pork was so tender with a glaze that was packed with flavor and the soft slices of pork and salsa roja really blended well together to make a great taco. These guys really know how to cook a pig. As far as the carne asada it didn't compare to the pork. In fact it was pretty unedible. The beef was tough and chewy and the taco was a soggy mess. 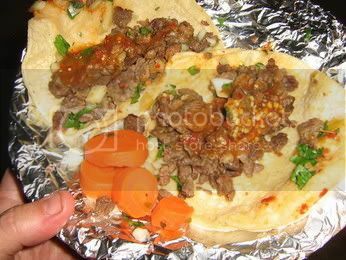 I got through the first taco but the second one was a struggle and I ended up scooping out edible beef with some of the marinated carrots. The asada aside these tacos were great. The pork was very well prepared and the carrots from the salsa bar may be the best taqueria carrots I've had during this taco hunt. They were marinated and spiced just right and nice and crisp. Another westside taqueria passes the test and I highly reccomend trying out the carnitas and adobada at Taqueria Estilo Mexico. I think you´ll like this blog: http://elhuaracheconcostilla.blogspot.com and http://hcc.6te.net. The adobada is good. Damn. My roommate got five(!) of the asada tacos and he and I both thought they were great. I think you got a bad batch, Bandini. 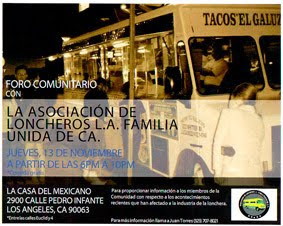 I live right behind this place by Paco's (which has a pretty mean hard shelled beef taco, by the way) and believe the asada is pretty good. I've been going there for years now and, by no means, believe it is the best, but is pretty delicious and edible. Have no fear trying it. I recommend the burrito. 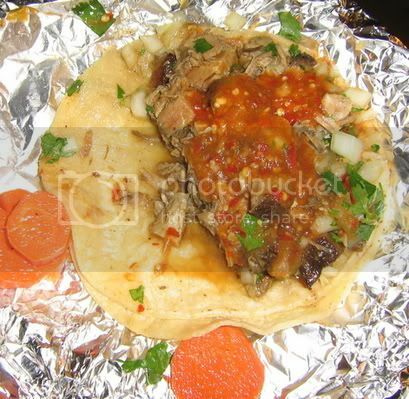 FYI, tacos are now, with tax, about $1.50; burritos $4.20.